The Future of Law (18): How long before the future gets here? Cont’d. Max Planck’s comment is right in line with what we learned last time from physicist Thomas Kuhn’s seminal work The Structure of Scientific Revolutions about how paradigm shifts come to be adopted. 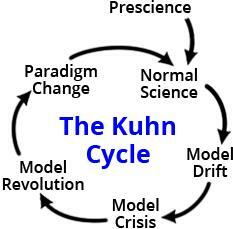 Kuhn also speculated that it takes a full generation for a paradigm to shift. “Short Answer: 25 years, but a generation ago it was 20 years. Many of the predictions made in this series are surprising, to be sure, but even more surprising is that these things are already happening but many of us just aren’t seeing them. Why not? Because our brains literally can’t take them in. In this post at the end of 2014, we looked at research from the emerging field of cultural neurology that suggests our brains’ observation and cognitive faculties are so linked to our cultural context that we simply can’t see paradigm shifts when they happen. Our cultural bias blinds us. We’re caught in The Emperor’s New Clothes syndrome. Who can see the shift? The new generation. By the time the new paradigm’s “opponents eventually die, and a new generation grows up that is familiar with it,” the paradigm we can’t see now will be the only one the new generation has ever known. And just to make things a bit more complex, as we’ve also seen before, some trends don’t sustain their momentum, and some paradigms never shift for lack of a following. Which is why passivity doesn’t serve us in times of great change. What’s the alternative? We can position ourselves to be surprise makers instead of surprise takers. We can grab the new paradigm and run with it, and in so doing help to shape it the way we’d like. We’ll talk next time about how we can do that. Author Kevin RhodesPosted on May 13, 2015 Categories The Future of LawTags cognitive impairment, cultural ethos, cultural neurology, Generation, Greg Laden, How long is a generation, legal profession, Max Planck, New normal, Paradigm, Paradigm shift, ScienceBlogs, The Future of Law, The Structure of Scientific Revolutions, Thomas Kuhn, Trends in law1 Comment on The Future of Law (18): How long before the future gets here? Cont’d. The Future of Law (17): How long before the future gets here? Well, for one thing, the future is already here. The signs of it are everywhere; this blog has been looking at them for a couple years. But for another, we’re talking about a paradigm shift here — a major change in perception and operative dynamics. Paradigm shifts don’t become the new normal until a critical mass of recognition has been reached. “People and systems resist change. They change only when forced to or when the change offers a strong advantage. If a person or system is biased toward its present paradigm, then a new paradigm is seen as inferior, even though it may be better. This bias can run so deep that two paradigms are incommensurate. They are incomparable because each side uses their own paradigm’s rules to judge the other paradigm. People talk past each other. Each side can “prove” their paradigm is better. “If there were but one set of scientific problems, one world within which to work on them, and one set of standards for their solution, paradigm competition might be settled more or less routinely by some process like counting the number of problems solved by each. “But in fact these conditions are never met. The proponents of competing paradigms are always at least slightly at cross-purposes. Neither side will grant all the non-empirical assumptions that the other needs in order to make its case. Author Kevin RhodesPosted on May 6, 2015 Categories The Future of LawTags Chaos: The Making of a New Science, Incommensurability, James Gleick, legal profession, Paradigm, Paradigm shift, The Future of Law, The Kuhn Cycle, The Structure of Scientific Revolutions, Thomas Kuhn, Trends in law3 Comments on The Future of Law (17): How long before the future gets here?